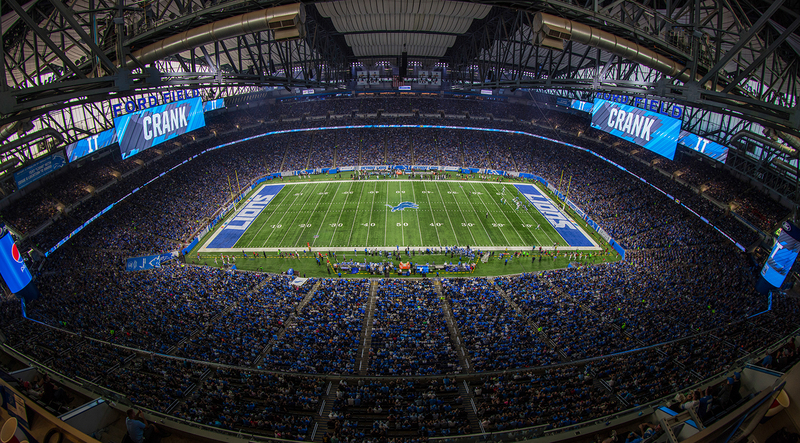 The Detroit Lions, one of the NFL’s oldest franchises, shook up the in-game fan experience last summer with all-new video and audio systems at Ford Field, as well as a partial control-room upgrade and the addition of more broadcast cabling. For the Lions’ game-day presentation staff, the goal for this offseason is to see what this gear can really do. Ford Field opened in 2002; 10 years later, the control room was upgraded to HD. Five years after that, the Lions embarked on a massive $100 million stadium renovation that would touch nearly every facet of the game-day experience. One-of-a-kind super-column display is 36.5 ft. high x 62.5 ft. around and features 6-mm line spacing. The most noticeable upgrade is the addition of 21 Daktronics LED displays, including new displays mounted above each end zone that are 250% larger than their predecessors. In total, the stadium now houses more than 26,000 sq. ft. of LED displays, featuring more than 28.1 million LEDs. The two main end-zone displays measure 39.5 ft. high x 152 ft. wide, with a 13HD pixel pitch. Flanking each end-zone display are two additional 13- x 59-ft. 13HD displays, which can be programmed individually or in conjunction with the main displays to create a 270-ft.-wide canvas. Four additional displays were mounted to the back of the main displays for fans seated high up in the end zones. That way, if they can’t see the opposite end-zone videoboard, they’ll still have access to all the live game action, replays, statistical information, and more. 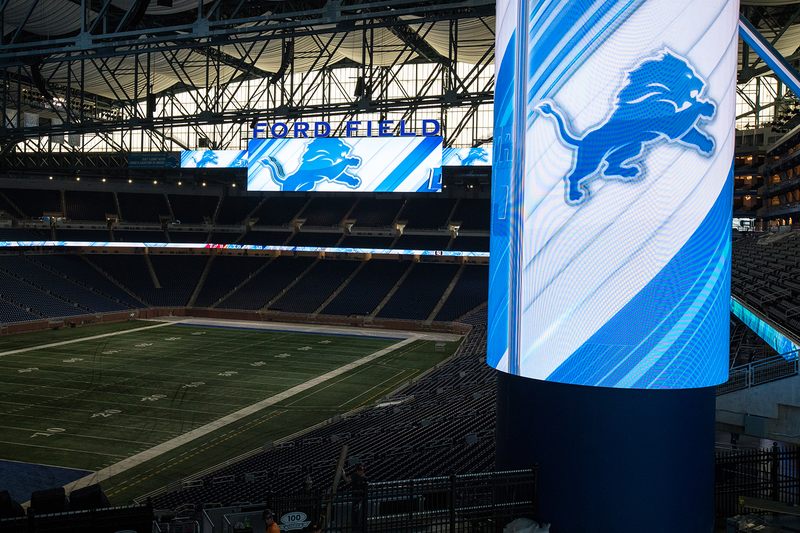 Ford Field also installed two one-of-a-kind super-column displays, which measure 36.5 ft. high x 62.5 ft. in circumference and feature 6-mm line spacing. Elsewhere in the stadium, three ribbon boards installed along the exterior fascia of Gate A welcome fans and provide messaging for fans outside the stadium, and four ribbon boards were added to the interior seating fascia. Lions game days didn’t just look better last season. Working with audio integrator Parsons, the team added new line arrays from Meyer Sound and transitioned from analog to Dante (analog is still used for backup on the main arrays). Although the Ford Field control room was upgraded to HD in 2012, the Lions opted to revisit the existing gear as part of the renovation. Working with WJHW and Alpha Video, the team added Ross Video XPression and Tessera graphics-control systems to power the new LED displays and upgraded its replay capabilities with three Evertz DreamCatcher servers, one operating in 4K. The team also invested in four IO Industries 4K cameras, which sit in stationary positions at each goal line to capture potential scoring plays. Overview of Ford Field during a NFL football game against the Carolina Panthers on Sunday Oct. 8, 2017 in Detroit. (Detroit Lions via AP). The Lions also added PTZ cameras on each goalpost and three to the super trusses above the field. Rounding out the seventh-floor control room, the team kept its existing Sony B7000 production switcher in place, upgraded its existing Evertz router, and expanded its KVM system. To accommodate the new equipment and better optimize the space, the Lions flipped the control room layout and added 10 ft. to the space. In addition, the team glassed off a section of the room and added a NewTek TriCaster to create a control room for its pregame show. For broadcast, the Lions worked with the national networks to boost the cabling, adding network switches in all four corners of the field and nearly a dozen drops throughout the building.